At AIS, we keep several virtual machines images “on ice” to support our test bench validation of the various software packages we develop. Hyper-V is a perfect tool in the software development tool chest as it allows a development team to quickly spin up the appropriate back office tools (Such as IIS or SQL server) to validate everything plays nicely in the sandbox. After some research, we realized the Exchange server was no longer validating against the test bench domain controller. Odd…. During our testing, we would reset the test bench baseline by thawing out the backup VM and restarting the VM. Every 7 days, the exchange server invalidated and reset its machine password with the Domain Controller. 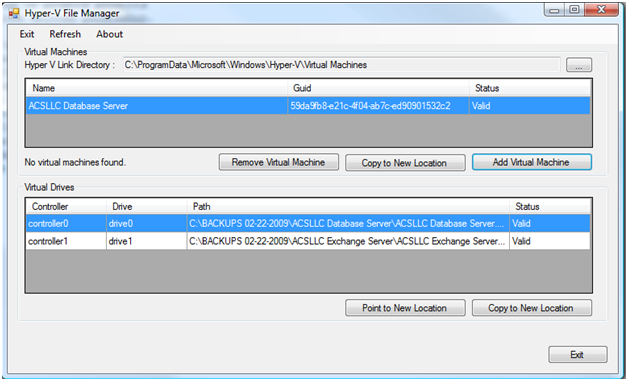 Domain controllers will allow machines to log on with the current or the last use machine password. By allowing the last password to be valid, MS gets around several domain replication issues. After 14 days, the machine password in the frozen image was no longer valid resulting in the domain rejecting the machine’s access to the domain. Fortunately, it is very easy to reset the machine password. As a parting thought, this will also impact users who backup their VM images as a disaster recovery process. If you recover a virtual machine image which is more than a couple of weeks old, you will very likely notice odd security and domain level issues with the restored image. Resetting the machine password should be part of your SOP for recovery operations. This entry was posted in Solutions on March 27, 2009 by ArmgaSys. The one function not currently well supported in Hyper-V is the movement and copying of VM and VHD files or virtual machines without using the Export / Import functionality. While it is possible to manually move VHD files, the operation is tedious and complex. At AIS, we have discovered the need for copying VHD files ranges from moving a large .VHD from a full hard drive to quickly supporting test bench copies from a gold disk image. After the 10 or 12 manual updates of the VHD XML file, symbolic links, and security we decided it was time for a utility. This entry was posted in Hyper-V on March 15, 2009 by ArmgaSys.